1. 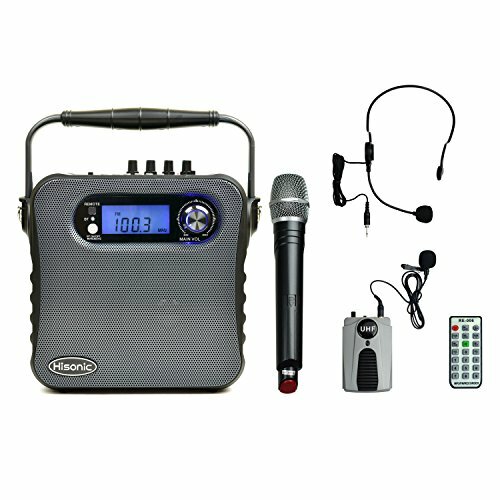 UHF Wireless microphone with dual channel that two people can talk at the same time. 2. Bluetooth Connection for easy music play. It streams music from your cellphone, iPod,iPad and computer to this PA speaker. 3. MP3 player Plays music from Micro SD Card and USB Thumb drive. 4.Lithium rechargeable battery that can play the system up to 8 hours. 5. Microphone priority feature allows the personal voice override the music . 6. Sound effects control the system with Treble, Bass and Echo. 7. Remote control for easy playing. 9. Auxiliary line port for other sound source to connect. 10. Two wired Microphone Jacks for more people to use it . 6.5mm and 3.5 mm microphone jacks. 11. Car 12V Voltage DC direct power connection. 12. One Handheld Wireless Microphone and One Body Pack Transmitter with headset. Speaker Size: 6" Hi-Definition Flat Response. Channel :Dual Channel for two people to use at the same time.